Up 'Til Dawn raise $146,180.78 for St. Jude’s at Belmont University Nashville, Tennessee, February 10, 2018. Students from Belmont University’s Up ’til Dawn student organization could be seen all across the country on Saturday morning as they revealed their 2018 fundraising total for St. Jude Children’s Research Hospital on national television. 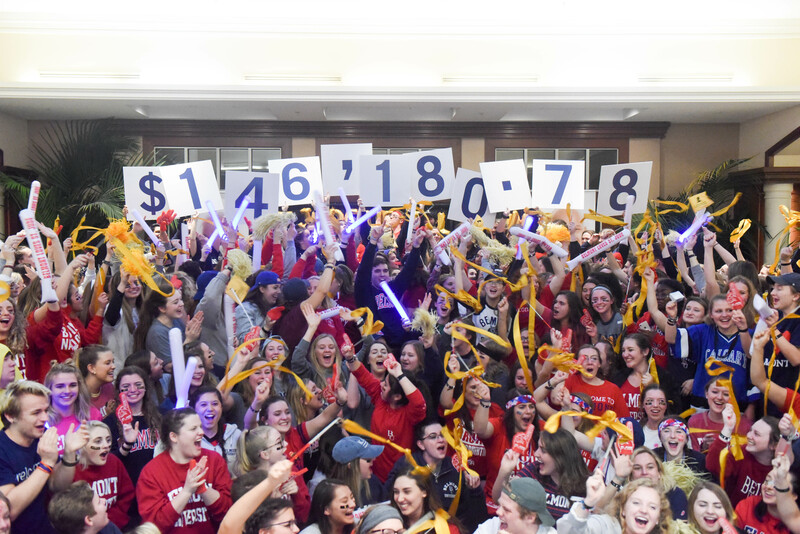 The highly anticipated total, $146,180.78 — the highest since the student organization was founded on campus in 2015, was revealed live on Fox and Friends at 6:50 a.m. by the Up ’til Dawn Executive Board, led by Executive Director and Belmont senior Joe LaMartina. More than 300 students were awake all night, celebrating their successful year in the Beaman Student Life Center with games, inflatables, a pizza party, dancing, sports, Zumba classes, special challenges and more. Students must create teams and raise at least $100 each to participate in the night’s festivities where they stay up in solidarity with patients and their parents who are awake all hours of the night during the height of their treatment at St. Jude. LaMartina, the focus of the national coverage, has a very personal connection to St. Jude and their work to cure childhood cancer. His 4-year-old little sister Lily was diagnosed with Precursor B Acute Lymphoblastic Leukemia (ALL) in the summer of 2016, and though she’s now in remission and doing well, her treatment protocol will continue for another year and a half. Lily hasn’t been treated at St. Jude, as she doesn’t live in Tennessee, but LaMartina credits much of her health to the hospital’s willingness to share their research with other facilities across the country. Money has continued to pour in since the students unveiled the total on Fox and Friends and now, the running total has reached $148,170.56. To watch the clip in its entirety, click here. To learn more about St. Jude and the Up ’til Dawn program, click here.